Trust Microboards Blu-ray media for recording and archiving your most important videos and data. 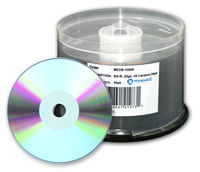 Perfect for use in Microboards tower duplicators, Microboards' Blu-ray media records at 4X. Featuring white inkjet printable, silver lacquer printable, white Prism thermal, and white Everest thermal surfaces, the Blu-ray media works with Microboards and most other disc printers, recorders, and publishers. Also available are silver lacquer and white inkjet re-writable Blu-ray discs. It's the low-cost Blu-ray media solution! This page was updated Tuesday, January 18, 2011 at 1:17pm by Microboards Marketing Department.